It's officially the last day of 2018 which also means it it my last blog post for this year. Woohoo! It's been a little bit of an up and down year (both personally and nail wise) but I've made it through! Today I have my top twenty (ish) nail art manis that I have down this year. I do really love looking back at the nail art that I have done. Like with all of my other favourites post this isn't in any particular order. Basically, it's whatever order my computer has put them in. Right - onto the nail art! 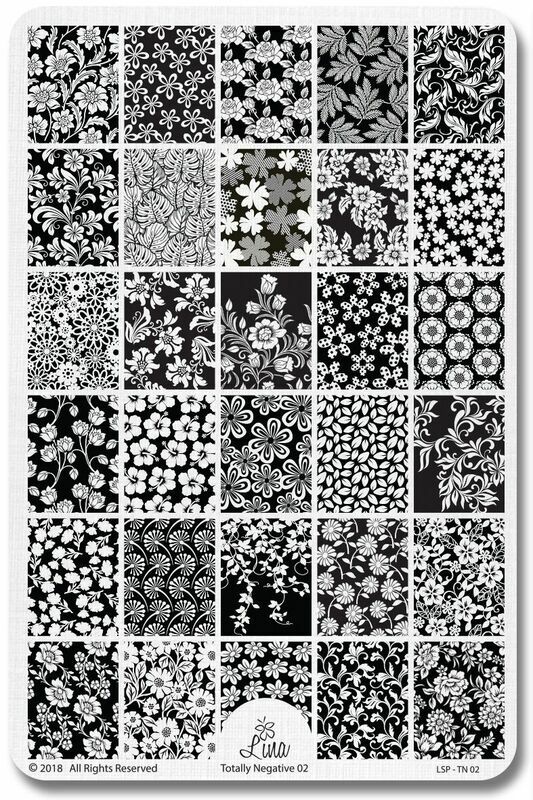 This stamping image from Pueen is probably one of my most used and definitely one of my favourite images among my stamping collection. It always makes for great manis. For this mani I used Emily de Molly Bright Retreat, Pretty Serious Cosmetics Poppet and Bunny Foo-Foo and stamped using Powder Perfect's Black Stamping Polish. 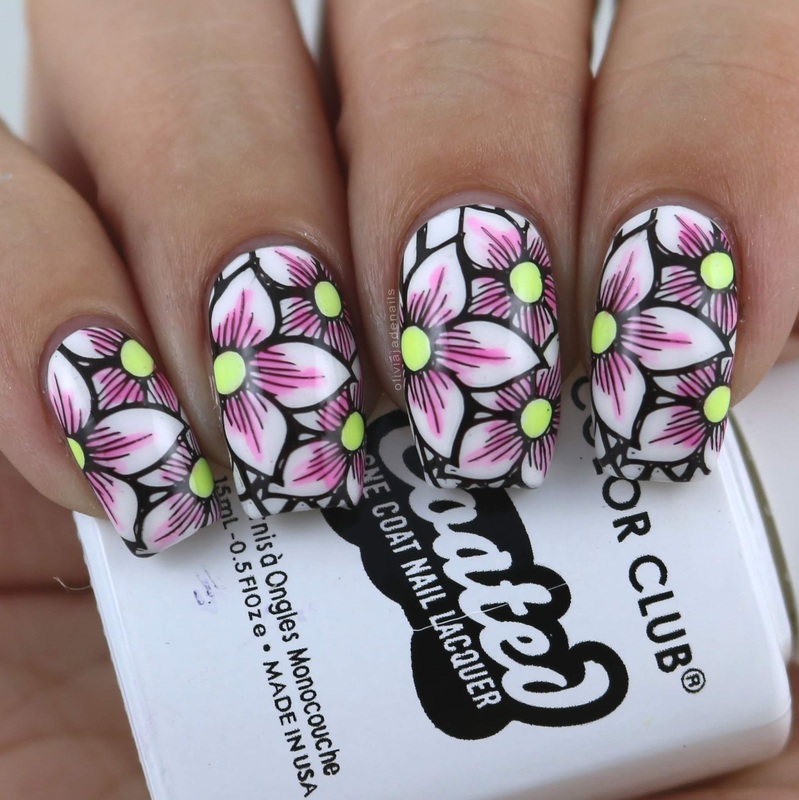 These matte neon polishes from Color Club make for some are nail art. Polishes used are Color Club Study Buddy, All Dolled Up and Cliff Notes, and stamped with Powder Perfect's Black Stamping Polish. Image is from Uberchic Love And Marriage 04. 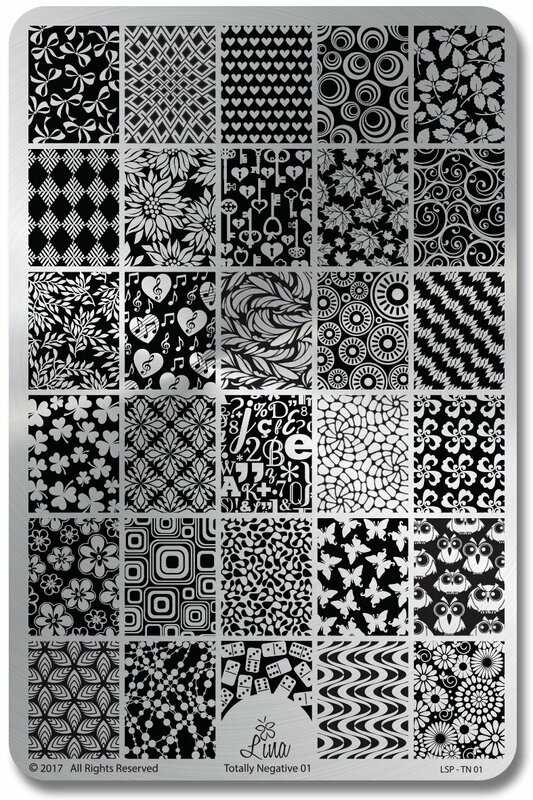 This next image is one of the images that sold me on buying Lina Nail Art Supplies 4 Seasons - Winter 02 stamping plate. I have seen so many awesome manis using this image - and I love mine. For this mani I used China Glaze Stone Cold and stamped using Hit The Bottle Looking For Mr Grey, A Flock Seagulls and Powder Perfect's White Stamping Polish. 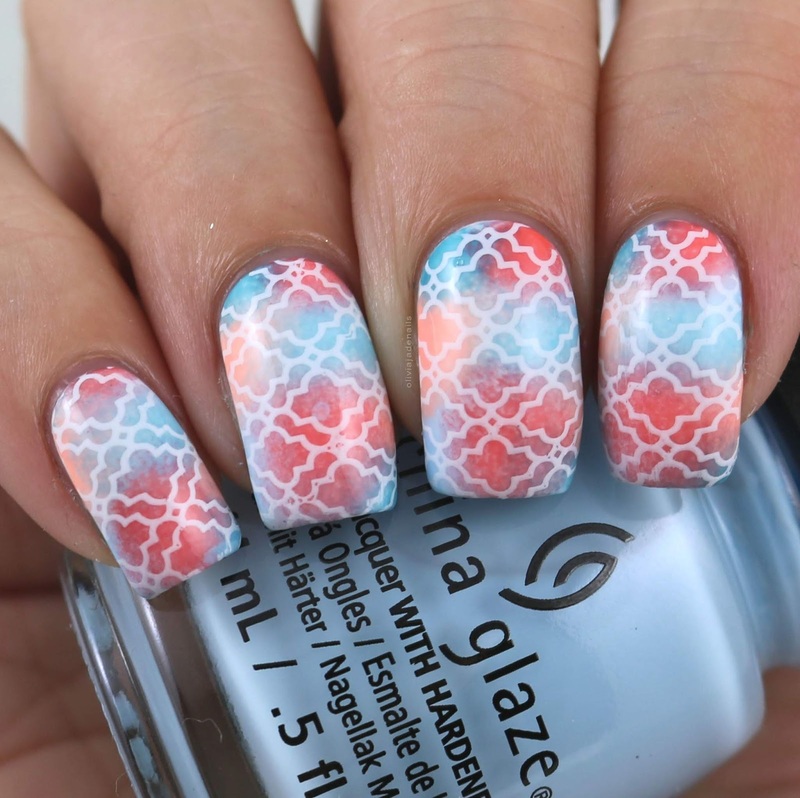 Negative space images plus multi-coloured sponged bases are always a win in my books. Especially when it involves the Pretty Serious Cosmetics Pastel Pets Collection. I used the entire first Pastel Pets Collection and stamped using Hit The Bottle's As Black As Night. Image from Lina Nail Art Supplies Totally Negative 01. Have I mentioned that I love multi-coloured sponged backgrounds? I think I started doing these last year and I am still obsessed with them. They are easy to do and usually turn out pretty awesome. For this mani I used Picture Polish Chillax, Swagger, Mad Magenta and Candy, and Hit The Bottle As Black As Night. Image is from Uberchic 23-02. You can never go wrong with zig zags or zig zags or whatever it is you want to call them. 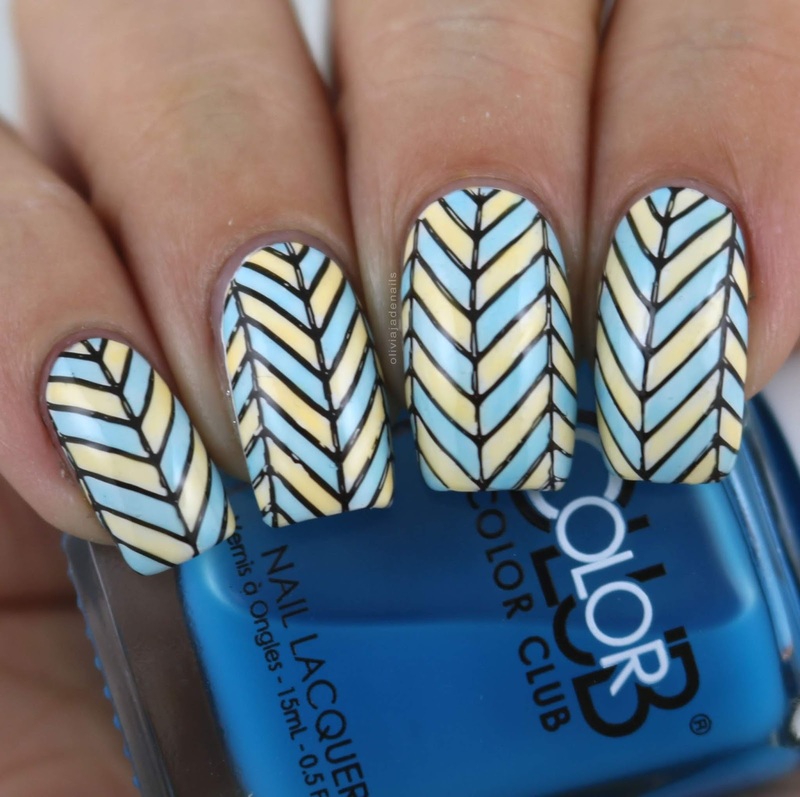 Uberchic Beauty released their second Got Chevron plate and I am in love. For the gradient I used China Glaze I Got A Blue Attitude and That's Shore Bright, and stamped using Hit The Bottle's Snowed In. 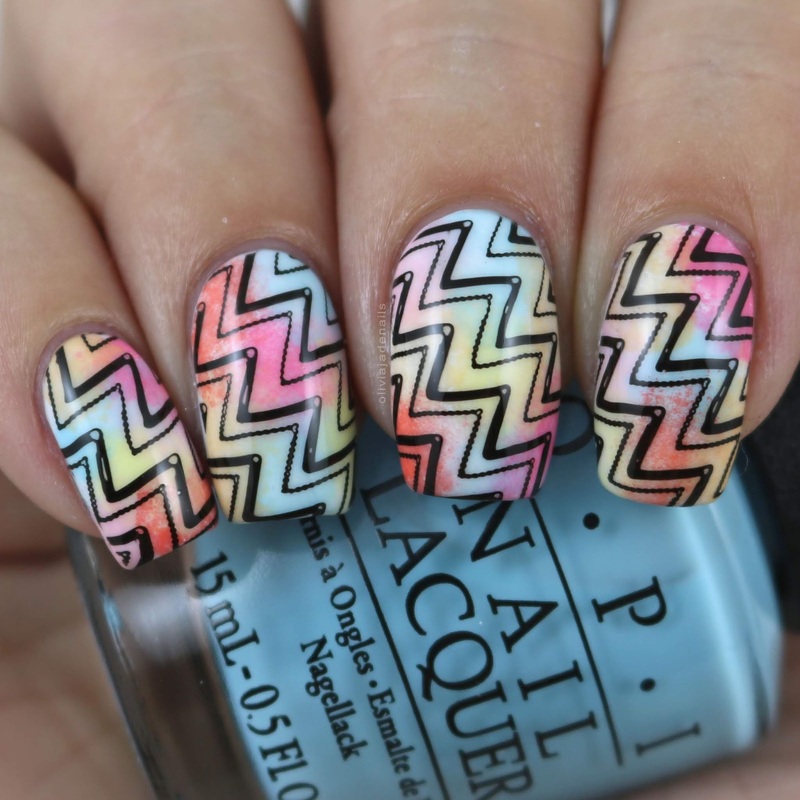 This is another mani I did using Uberchic Got Chevron 02. Seriously, if you don't have this plate then you definitely need it. I don't think you can fail with it. 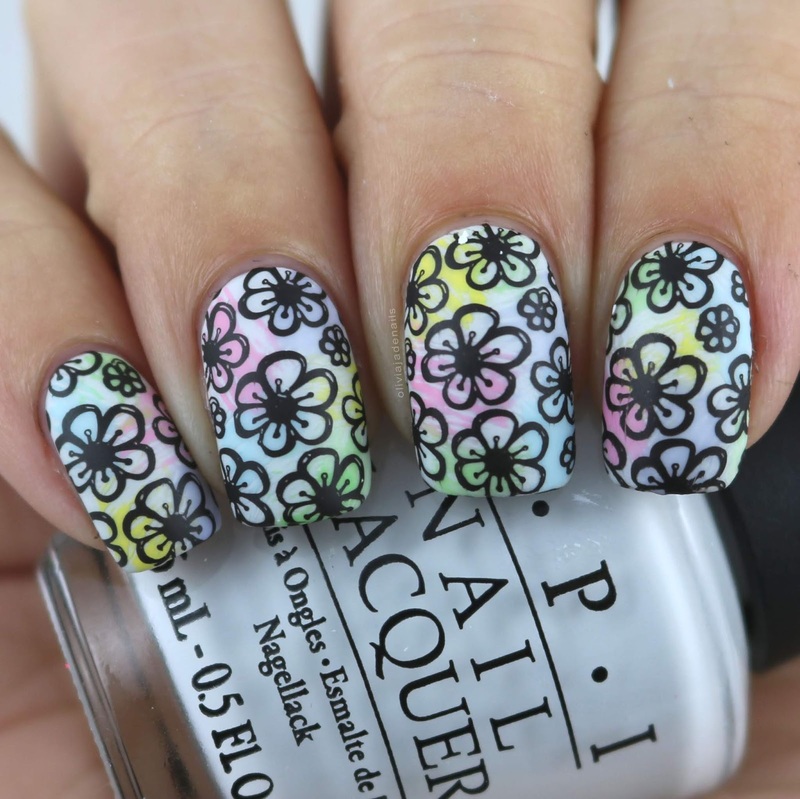 For this mani I used the entire OPI Retro Summer Collection and stamped using Powder Perfect's Black Stamping Polish. I have always been a huge fan of simple manis and this is one of them. I love the shift within the polish along with the image. It really gives me serious dragon vibes. The base colour is OPI Just Spotted The Lizard, stamping polish is Hit The Bottle As Black As Night and image is from Powder Perfect Kings & Castles 1. Lead Lighting is one of those techniques that I go through stages with. I do it lots and then I have large gaps where I forget that it exists. It's still really, because I usually love the result. For this mani I used Pretty Serious Cosmetics Presence and a bunch of custom made tints from Emily de Molly. 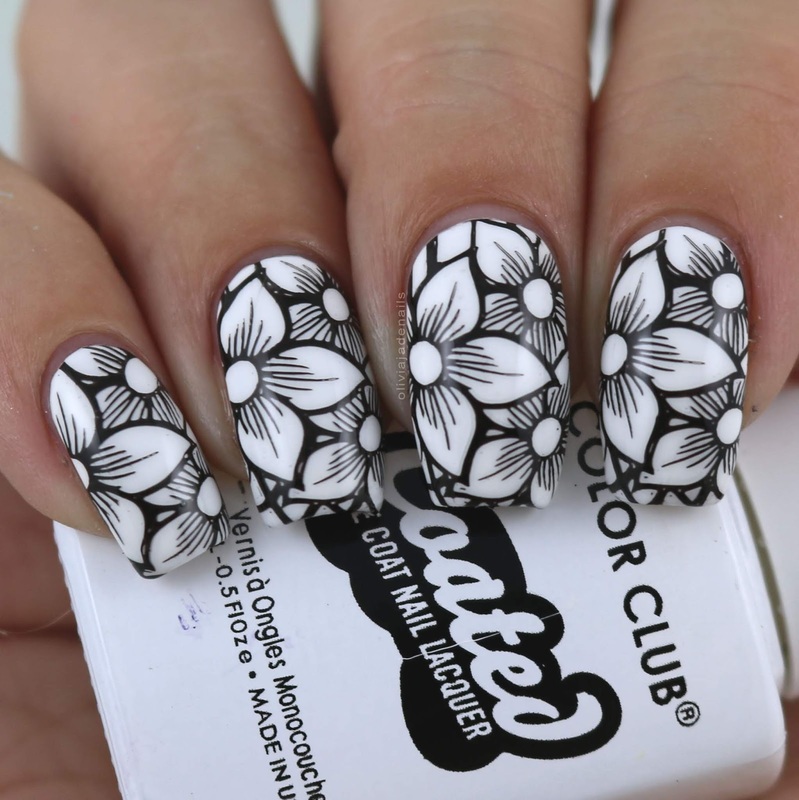 Black and white manis are always amazing. They are easy to do, they look awesome by themselves or as an accent nail. This particular mani is probably one of my all time favourite manis that I have ever done. This mani was the first ever mani I did using one of the stamping plates from Marianne Nails. OMG! The quality of these plates are amazing! But I'm getting side tracked. For this mani I used Color Club's French Tips and Hit The Bottle As Black As Night. 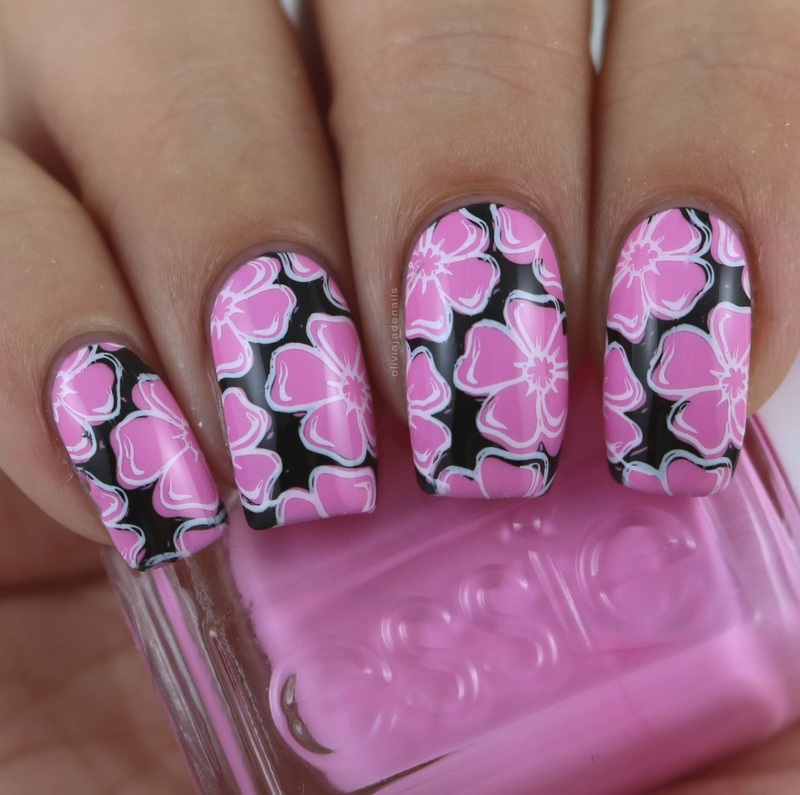 Image is from Marianne Nails EYNails No.1. Honestly, I can't decide if I love the black and white version or the coloured version of this mani more so I have included them both. For this version I used Color Club's French Tips and my neon pink and yellow custom tips from Emily de Molly. 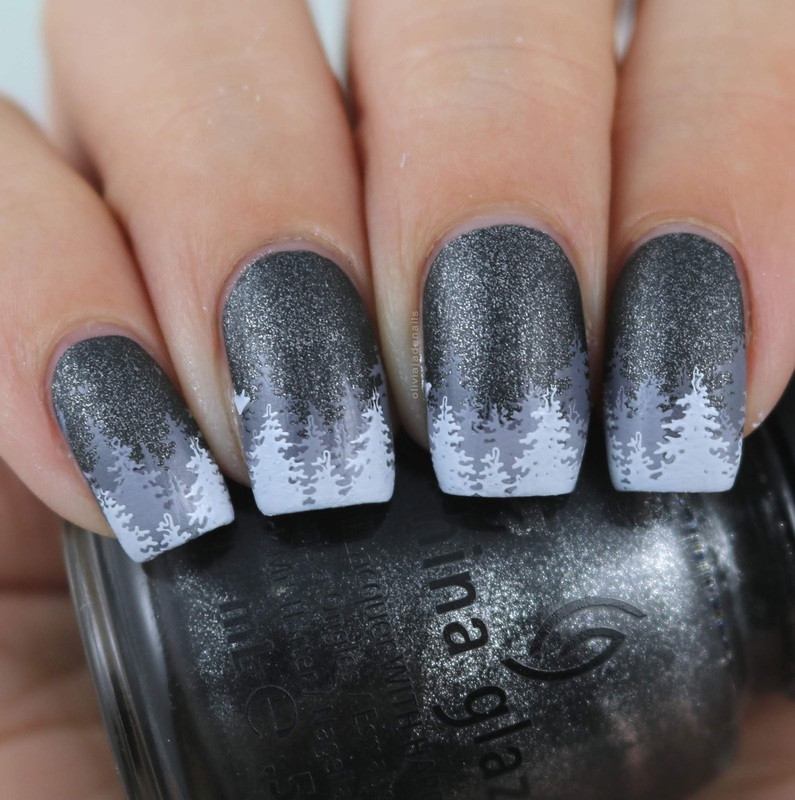 This mani is easily a favourite of mine and apparently a lot of my followers. I have been tagged in quite a few recreations and have even seem some others copy it (sadly without credit). I do love seeing recreations of my manis so if you ever do one make sure you tag me so I can see it. For this mani I used China Glaze Flip Flop Fantasy, Thistle Do Nicely, I'll Pink To That and Bottoms Up. Stamping polish is Hit The Bottle As Black As Night and image is from Lina Nail Art Supplies Totally Negative 02 stamping plate. 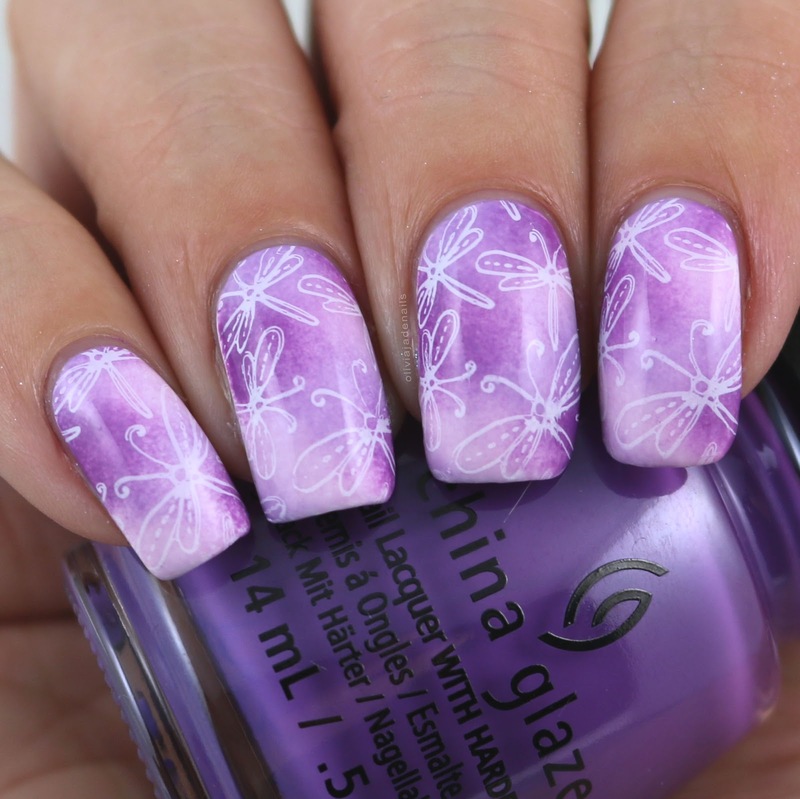 I have always loved butterfly images and this mani has made me love dragonfly images as well. For my base I sponged on China Glaze Are You Orchid-ing Me, Tart-y For The Party and Stop Beach Frontin' and stamped using Powder Perfect's White Stamping Polish. Image is from Uberchic 26-01. I think that this is my most liked mani on Instagram for this year and I can see why. 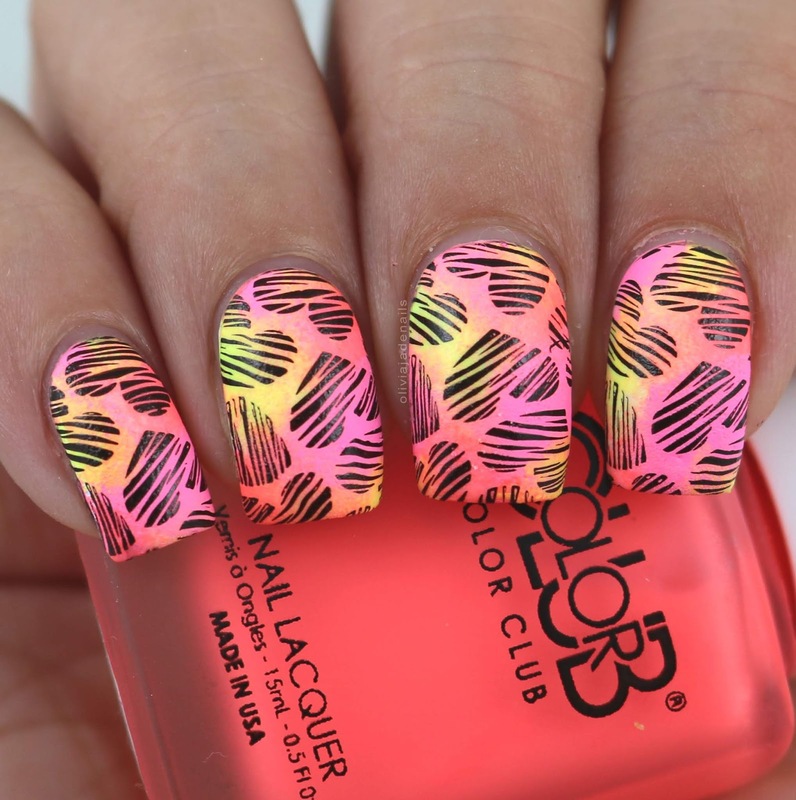 It is such a cool mani. For my base I used Emily de Molly All The Feelings over Borrowed Time and stamped using Hit The Bottle As Black As Night. Image is from Uberchic 25-03. Again, lead lighting for the win! It's simple but effective. Polishes used are Color Club French Tips (base), Out Of The Blue and Darling Clementine. Layered stamping manis are one of the things that I struggle with. I think it's my curved nails that through the images off. This mani, however seemed to line up pretty well and I couldn't be happier with the result. For my base I used Essie Backseat Bestie and stamped using Hit The Bottle As Black As Night and Powder Perfect's White Stamping Polish. Dry brush manis are those manis that I really should do more often. I love this one - especially mattified. For my base I used OPI My Boyfriend Scales Walls, and dry brushed using OPI You're So Outta Lime, Pink Friday, I Just Can't Cope-acabana, Sailing & Nail-ing, and You're Such A Budapest. Image is from Uberchic 21-02. Most of the time when I go to do my nails I have some sort of plan, however this mani I went in with absolutely no idea what I was going to do. Luckily for me, I love the result. Polishes used are Emily de Molly Bright Retreat, China Glaze Athlete Chic, More To Explore. Water-Falling In Love, Wait N' Sea and UV Meant To Be. Stamping polish is Hit The Bottle Snowed In and image is from Uberchic Moroccan Delight. This is another mani I did using Uberchic's Moroccan Delight stamping plate. This plate is a favourite of mine for very good reason. 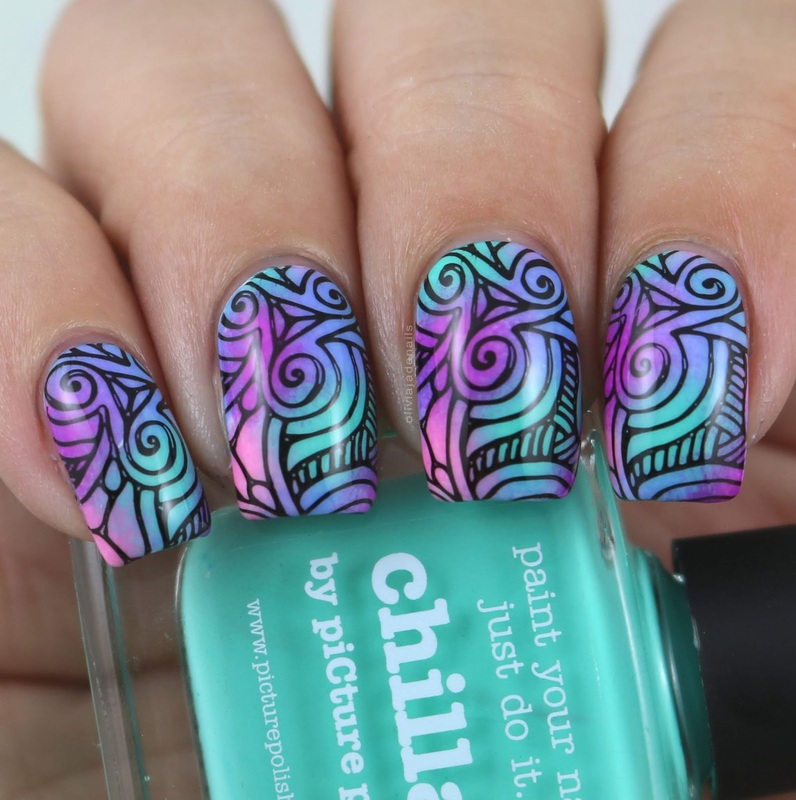 The images are awesome and make for amazing nail art. For this mani I used Pretty Serious Cosmetics Fluffykins, Peachie Poo, Bon Bon, Cutie Patootie, Little Duckling and Bunny Foo-Foo, and stamped using Powder Perfect's Black Stamping Polish. 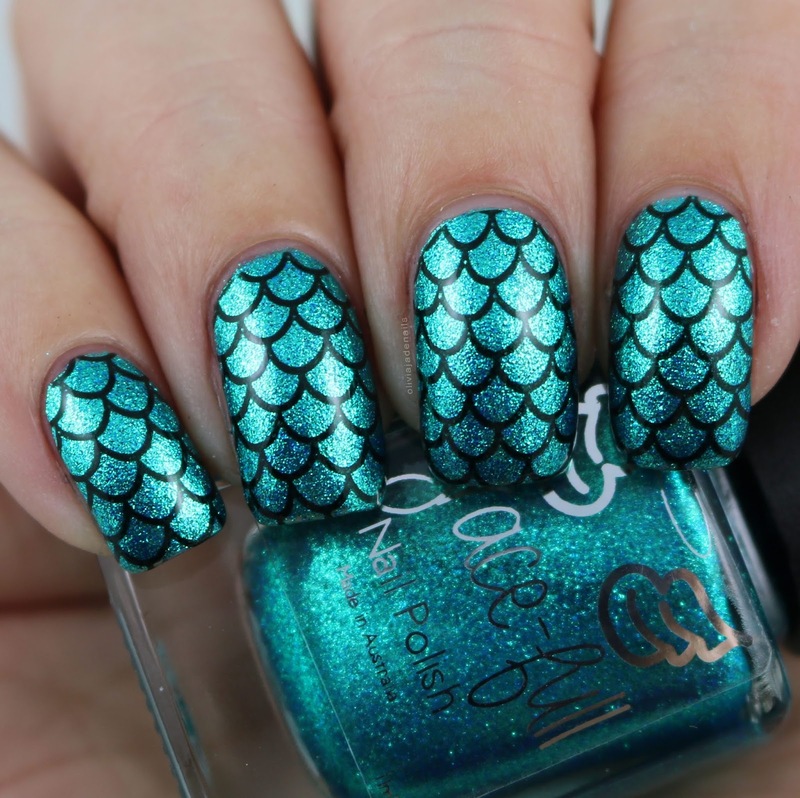 I did two very similar mermaid manis this year and it killed me having to cut one of them from this post but it really made no sense to keep both manis. So how did I decide? Well this one was the more recent so it stuck in my mind. It's one of those manis that I wish I could have kept on longer. My base is Grace-full Nail Polish Siren Tale and stamped using Powder Perfect's Black Stamping Polish. Image is from Bundle Monster BM-XL211. This is one of my most recent favourite manis. Matte bases with metallic stamping are amazing and definitely something I want to do more in 2019. Polishes used are Lavendare To Find Courage (which I mattified using Picture Polish's G'Day Matte), China Glaze Admire and Hit The Bottle Snowed In. 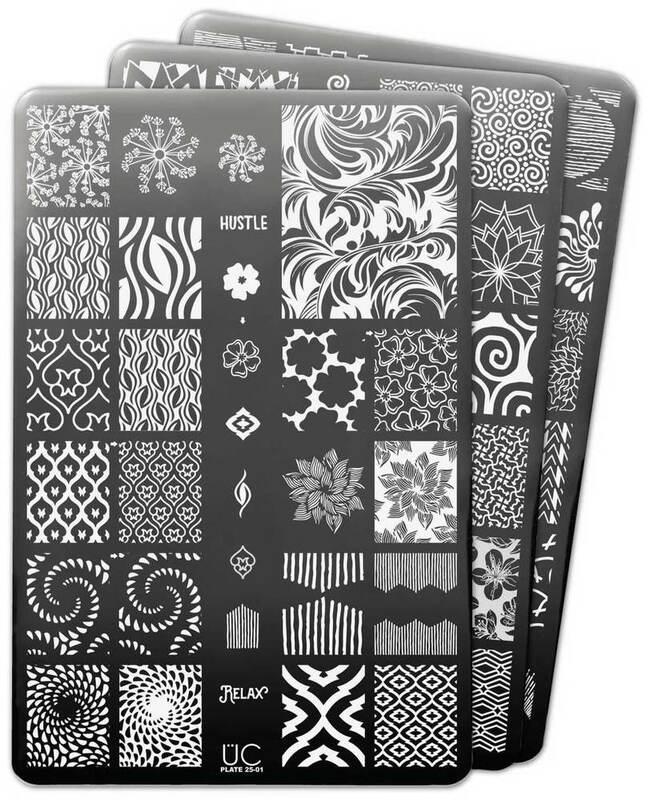 Images are from Lina Nail Art Supplies Feeling Shapely 06 and Opposites Attract. That brings us to the end of my favourites for 2018. While narrowing down my favourites is so difficult I do really enjoy seeing them all together in a post. I hope you guys have enjoyed seeing these posts. A huge thank you to you all for visiting my blog throughout this year. I hope you have enjoyed my posts. Feel free to let me know if there is anything in particular you want to see and I will see what I can do. I'll see you all next year! Trying to sort through and decide my favourite polishes (both mainstream and indie) has proven to be extremely difficult. Stamping plates on the other hand are definitely a little easier for me to pick my favourites. Maybe because there is less to choose from than there are polishes? Or maybe I just fall in love with polish more so than plates. Who knows. 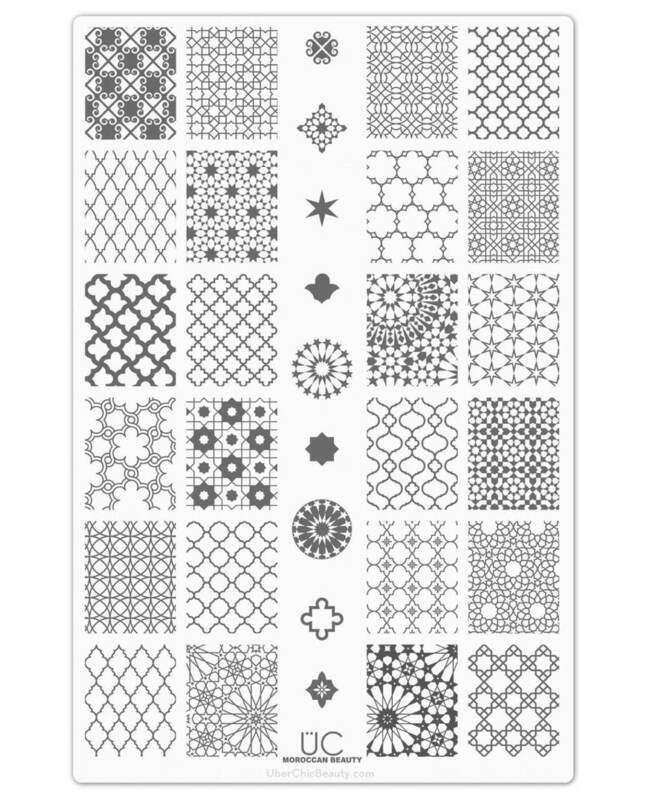 While I did aim to have a top ten for stamping plates I actually ended up with a top thirteen. 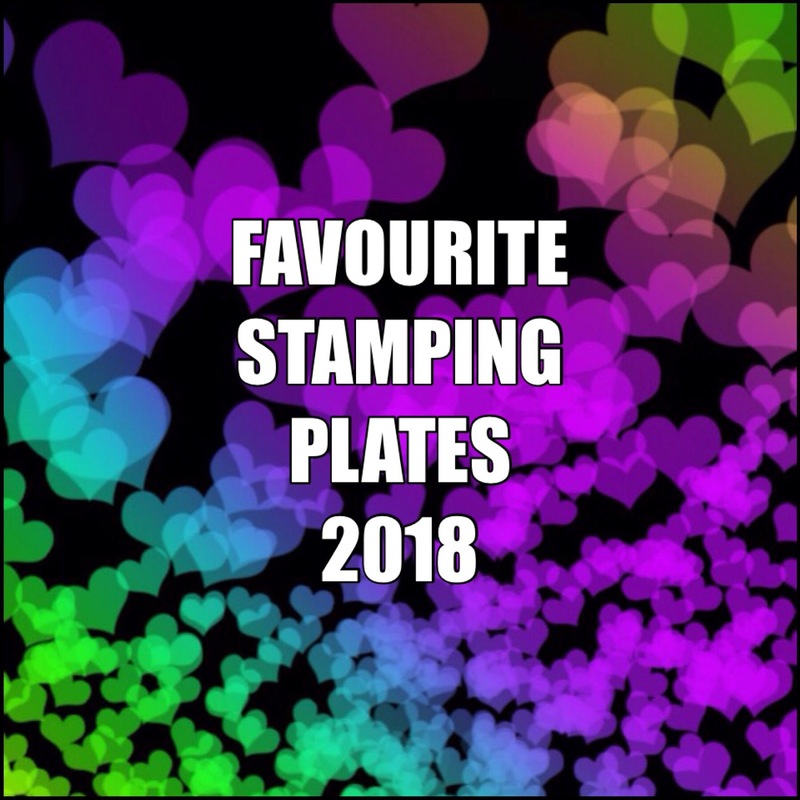 Here are my favourite stamping plates (in no particular order) for 2018. 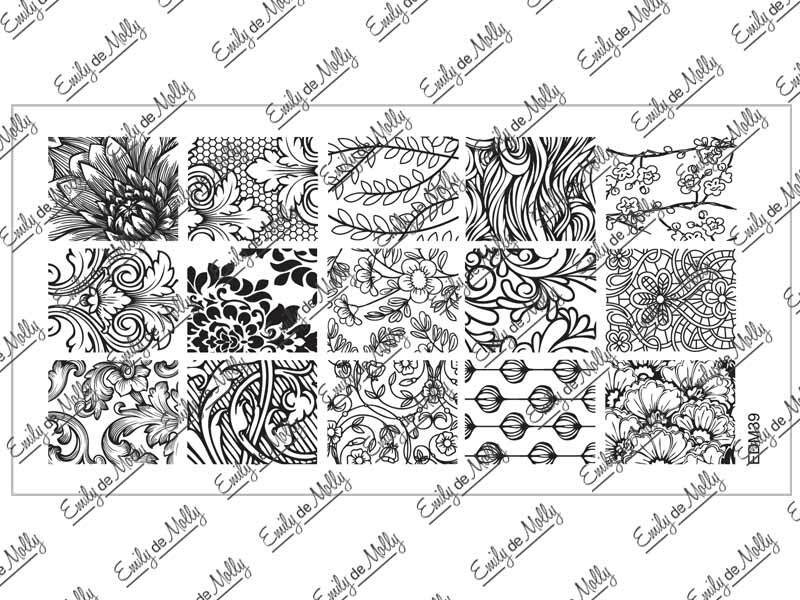 Emily de Molly don't do a lot of stamping plates but when they do they are awesome. 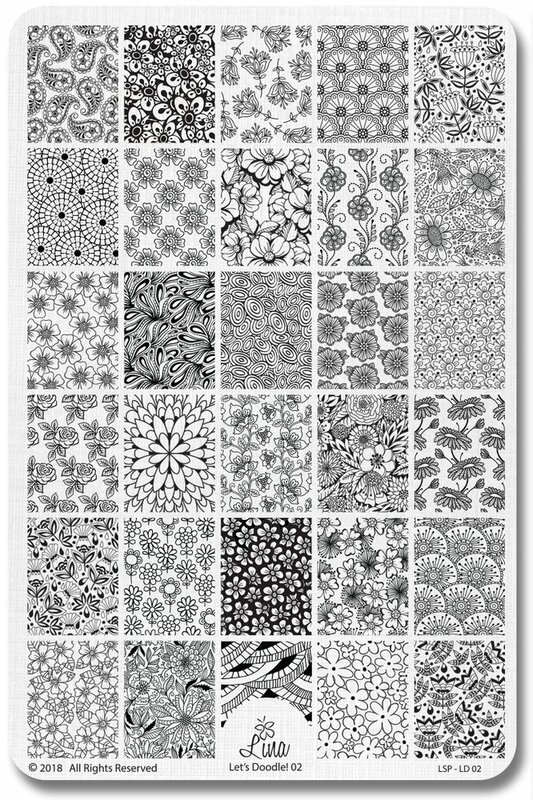 They stamp beautifully and have some of the most unique designs. You can see some of the manis I did using this plate here. 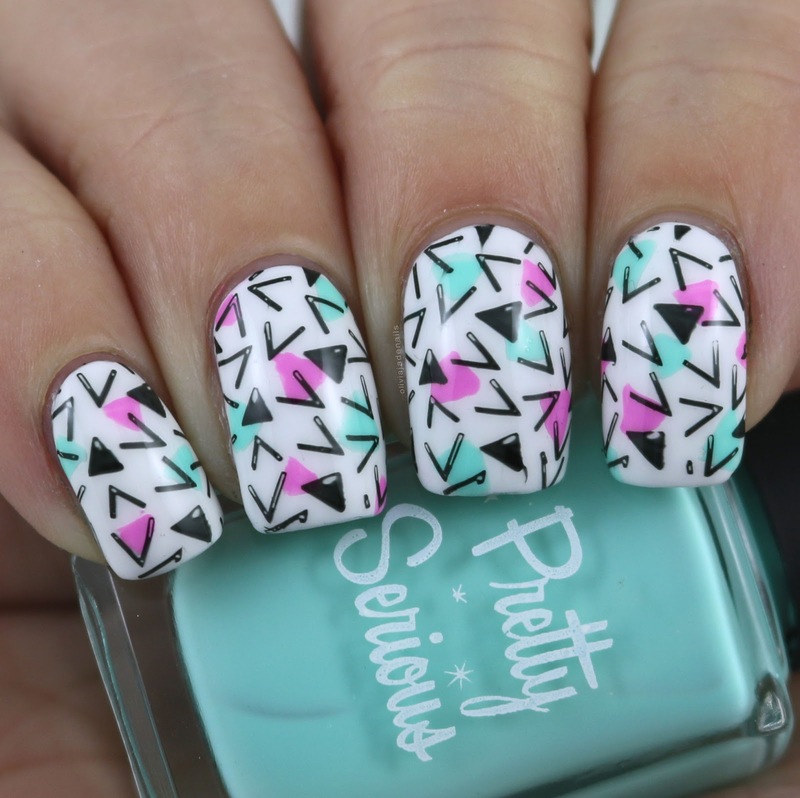 Lina hit it out of the park with this stamping plate! 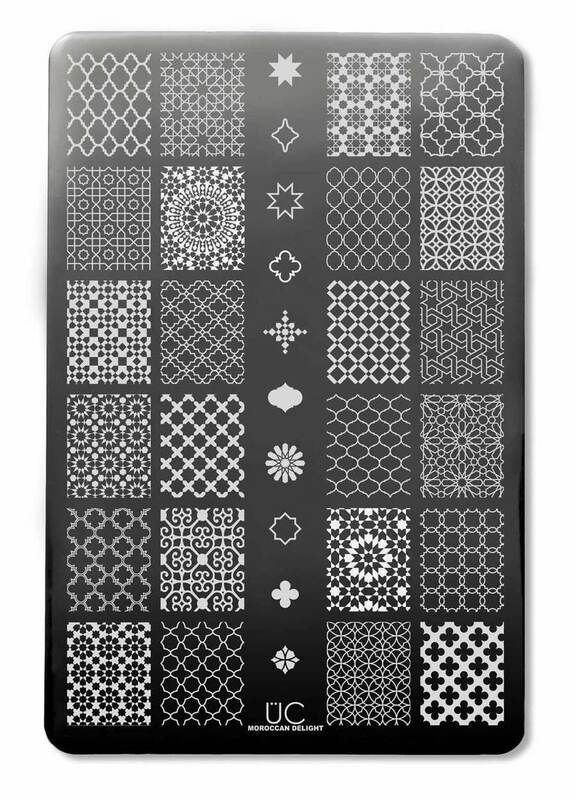 I absolutely love the first plate in this range and this second plate is no different. There are so many images on here that just scream my name. You can see the manis I did with this plate here. This is another one of the plate series that Lina does that I absolutely love. I mean can you go wrong with negative space images? They work perfectly with the sponge backgrounds that I love to do! You can see the manis I did with Totally Negative 01 here and Totally Negative 02 here. 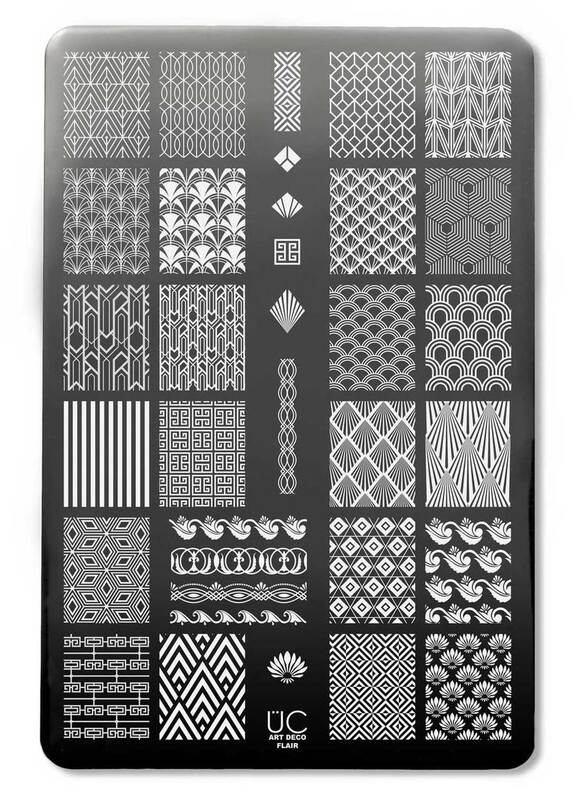 The two plates in the Art Deco range both feature a bunch of really awesome full sized images. I think the make for some really fantastic manis. You can see how I used the Art Deco plate here and Art Deco Flair plate here. Uberchic collections are really the first thing that drew me to the brand all those years ago (well in fairness they were the only things that they were releasing when they first stated). They always have such great images on their plates, particularly the full sized images. If I am honest, I rarely pay any attention to the single images on the plates in the collections. You can find individual pics as well as manis that I have done with these plates here - Collection 24, Collection 25 and Collection 27. 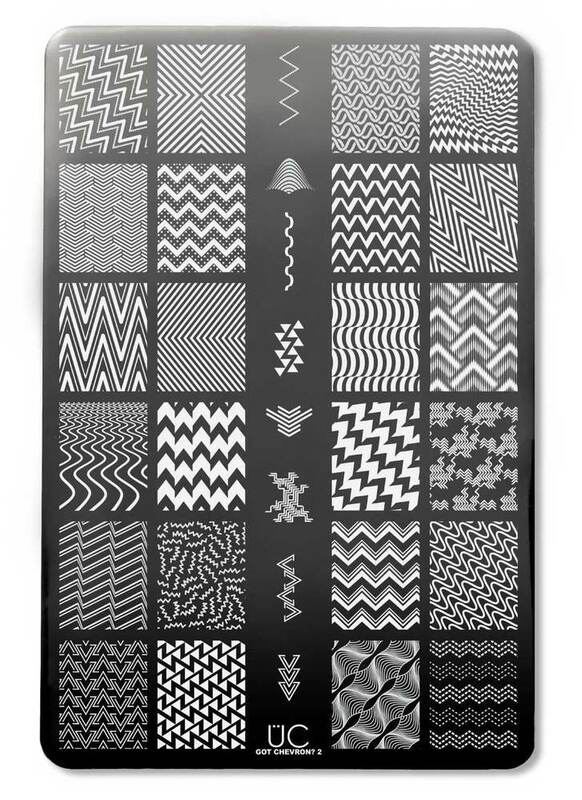 Uberchic released the first Got Chevron plate and I instantly fell in love. When I found out they were releasing a second plate I knew it would be love at first site. And it most definitely is. 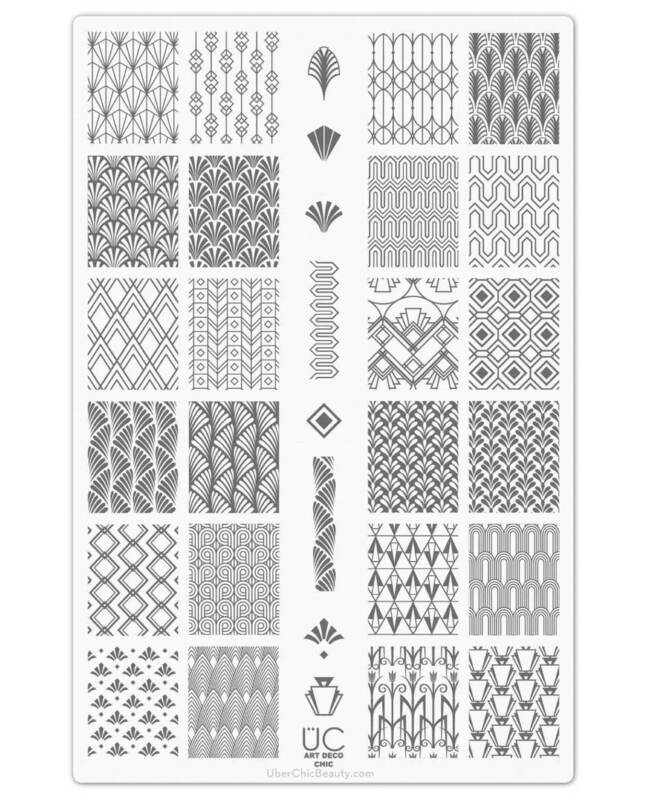 The Got Chevron plates would easily be some of my favourite plates that Uberchic have ever done! You can see the manis I did using this plate here. The Moroccan series is another one of my all time favourite series that Uberchic have ever done. 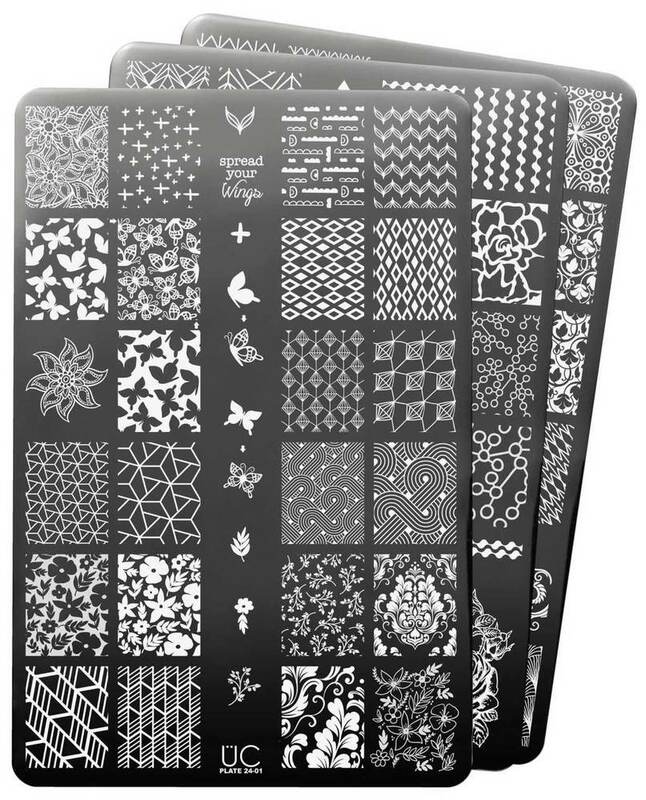 I think all the images on both plates are gorgeous and make for some really fantastic manis. You can see how I used Moroccan Beauty here and Moroccan Delight here. 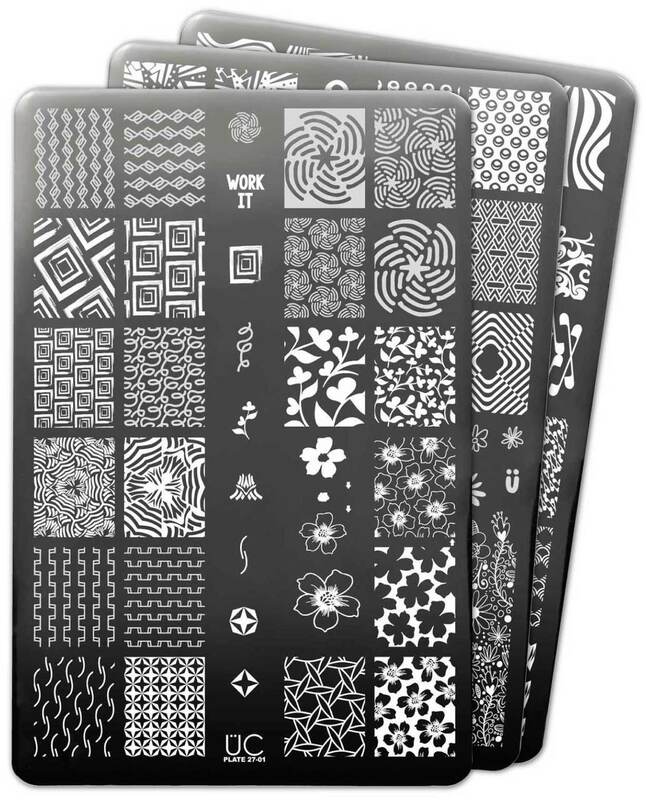 It has definitely been a good year for stamping plates! I am excited to see what brands do next year. I am really hoping for some more plates in some of my favourite series. What plates have you been loving? Are there some that you think I need to try out? Let me know in the comments. 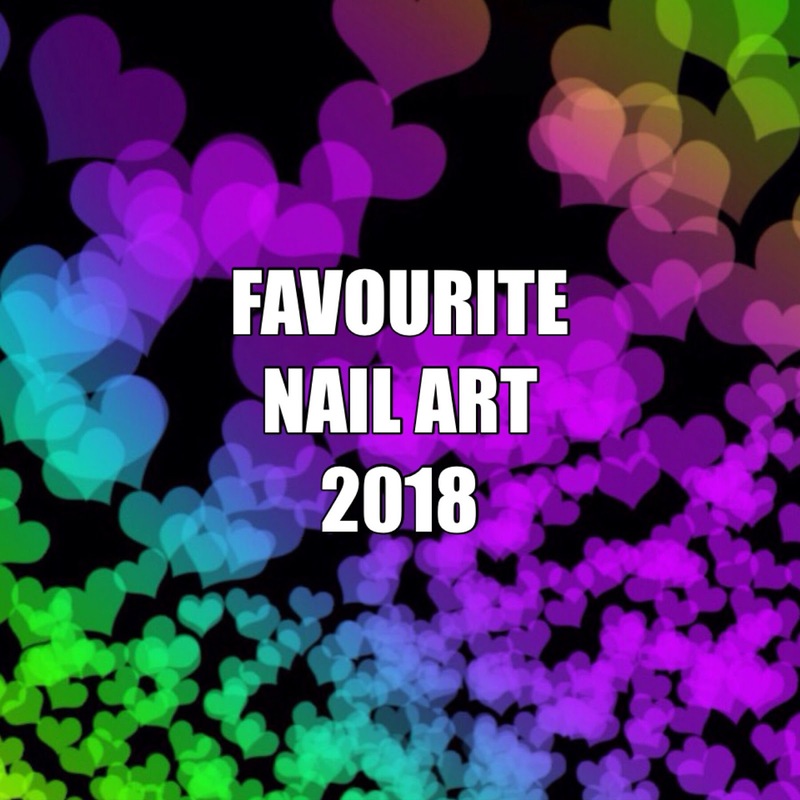 Tomorrow is my last day of favourites - it's my nail art favourites. Eek! I'm scared. These are going to be so difficult to narrow down. I think I can say that this is by far the hardest type of blog post that I do each year. I can't even begin to tell you how long it took me to narrow down my indie favourites for this year. There have been soooooooo many amazing indie polishes this year. I originally started with 98 favourites (yes that's right - 98 favourites) and I some how managed to narrow it down to my top 25. I did try to bring my favourites down to a top 20 but I couldn't do it. I have excluded any of Emily de Molly Limited Edition polishes because....well now I am thinking about it again, I'm not sure why. I think mainly it was to make my job easier. I also haven't included any of the polishes that I put in my favourite collections post. There is definitely quite a few indie polishes in there. Anyway, as per usual this post isn't in any particular order. Emily de Molly killed it with their releases this year! They made up to bulk of my favourites for the year (there were over 60 of them) and they were probably the hardest to cut back on. Dancing Through Sunday was part of the August Releases. Pictures really don't do this polish justice. It's so much prettier in person. Just Your Type is one of my new favourites. This polish was released early this month and stole my heart. It's a stunner! You can find more pictures of this beauty here. Save Your Boredom was also released this month. I love this one! I think this would have to be one of my all time favourite EdMs, along with Sea Of Lies which is also in my favourites for this year. Seventh Seal is the last one from December's release. I think this polish is awesome both with and without the magnet. 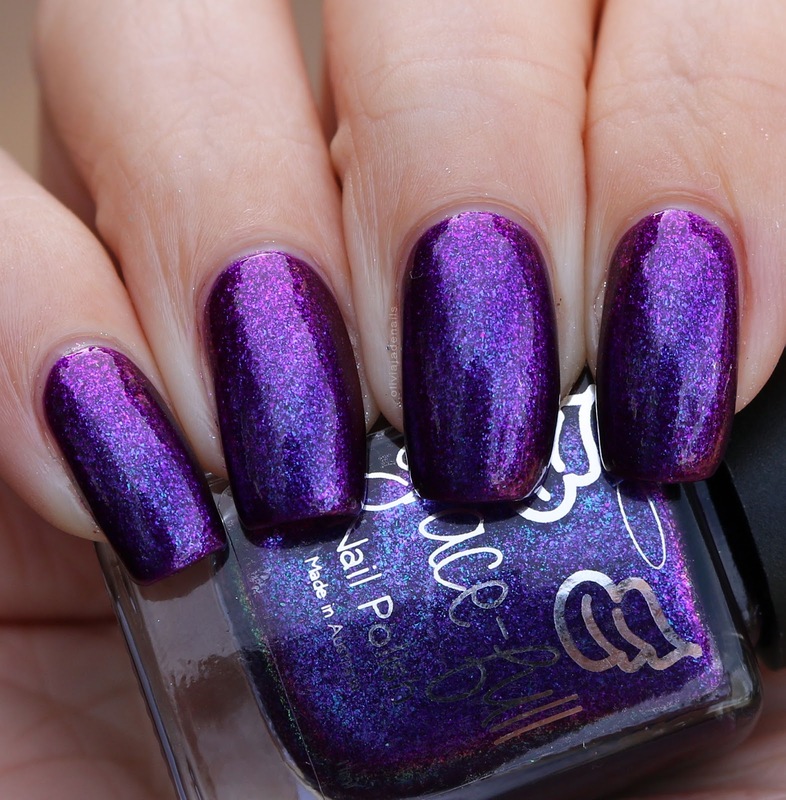 Linked Irony is a polish from February's release. This is such an interesting and cool polish. I don't own anything like it! It also looks really cool with nail art over it. Made Of Emotion was part of the releases in July. This polish screams my name! I'm not sure what else I need to say about this one. Perfect Moments is another July release. I'm not too sure if I have even put a thermal polish in my end of year favourites before, but this one is a definite must. It's perfect in both states. Charismatic Puzzle was originally released in March. I actually have a few polishes I love from the March release, which I will share with you in a minute. As you may be aware, I love multichrome polishes and this one shifts beautifully. Prismatic Mode is another favourite from the March release. Flakies are always a favourite of mine, and this is one is awesome. Not only does it have flakies, it also is a gorgeous colour and has holo! Sharp Turn is the last of my favourites that were released in March. We all know that I am a sucker for pink polishes - and neon pink is even better! Travels By Day was released back in May this year and it was love at first sight. It's funny to think that I had no real interest in magnet polishes until this year. Winter's Gate is another polish released back in May. This is such a delicate and beautiful shade. Sea Of Lies is easily one of my all time favourite polishes that Emily de Molly have ever released. Given how quickly this polish keeps selling out I'm guessing I am not the only one who feels this way. If you haven't already grabbed it then definitely do! You can see more of my swatches and my actually review here. 3 Words, One Song was released as part of the Polish Pick Up in October. It was actually a toss up between this one and Opal Illusion (which was one of the Facebook exclusives) but I think I love this colour a little more. Perfect Formation was the January Polish Pick Up shade and my first ever PPU shade. Apart from the fact that this polish is absolutely stunning, this polish is one that was pretty hard to get. It was released at 3am (Melbourne time) and sold out incredibly fast. How I managed to get it whilst being heavily medicated (I just had an operation) is beyond me. Memory Maker is part of the Valentine's Trio from this year. This is such a gorgeous trio. I actually had two of the three polishes in my favourites for the year but I had to cut down the favourites. This one obviously made the cut. Grace-full is another one of my all time favourite indie brands. I have quite the collection and have really loved watching them grow over the years. This year I feel as been a bit of a quieter year for Grace-full but that hasn't stopped the polishes from being amazing. Gram's Unicorn is a polish from the Charmed Again Collection. This is definitely a very 'me' polish and hands down one of the greatest polishes released from Grace-full. Hair-o-ine is part of the Enchanted Fables Collection. I actually have a few from this collection that made it into this post. I probably could have put the whole collection as a favourite to be honest. It's an awesome collection. Anyway, this polish was love at first sight. It's seriously drool worthy. Pick Your Poison is also from the Enchanted Fables Collection. This is definitely a bit of a surprise for me seems it is a red polish but it is so close to pink which is why I love it. Plus the formula is amazing! Siren Tale is the last polish I have from the Enchanted Fables Collection. I mean who doesn't love a mermaid polish? 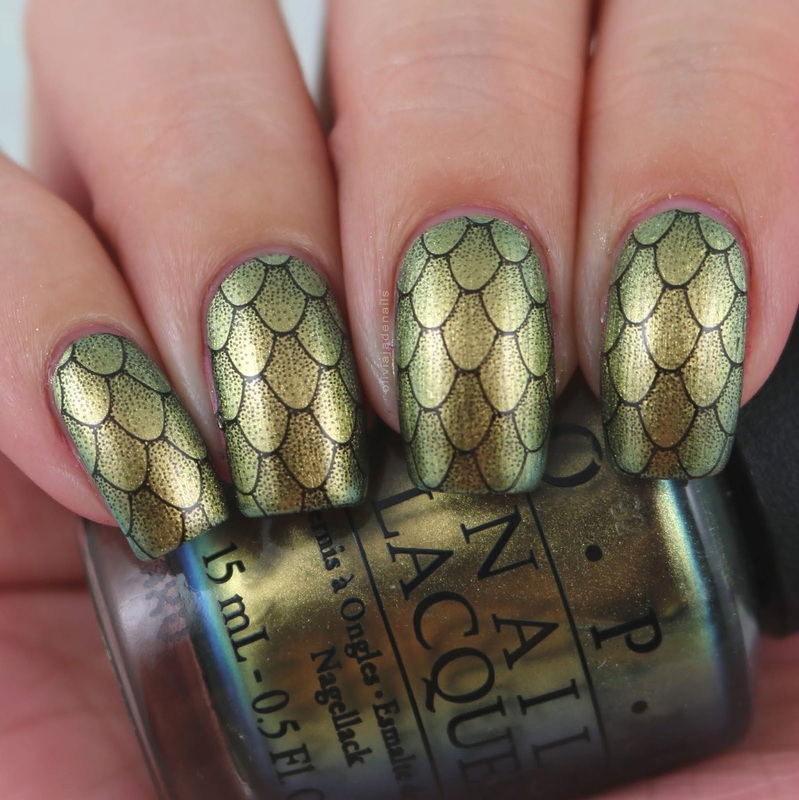 I also did some mermaid nail art with this polish which I also love. It may make it into my nail art favourites but we will have to see. I am having so much trouble narrowing those down too. Moon Face is from the Faraway Collection. This is one of those polishes that looks stunning on it's own, with nail art or as a simple accent nail. It's some serious bling! Son Of Jacob is from the Nolite Te Bastardes Carborundorum Collection. I am obsessed with this polish! Theresa asked me a little while ago what polish she should wear for a couple of days and this was my pick. - but without the magnet. Don't get me wrong, I love it with the magnet, but without the magnet is even better. It's so shifty and definitely one that you couldn't get bored of. Magical Muses is the August Polish Pick Up shade. I love this polish in each of the states. It's so pretty. Miss Speedster is the June Polish Pick Up shade. This was love at first sight and I think the best Polish Pick Up shade that Grace-full have done so far. I'm excited to see what else Grace-full do for the Polish Pick Up. I don't tend to buy many Lilypad polishes but there was one polish this year that I saw swatches of I just had to have it. Cuddle Team Leader was released as part of June's Polish Pick Up. There was no doubt that this polish was going to be making it into my favourites for 2018. This polish is just as amazing in person as it is in pictures. I wore it for a week and could have happily kept wearing it. What an absolutely amazing year it has been for the indie girls! I am beyond excited to see where these girls take us in 2019! Bring on the new polishes! Which indie brand has been your favourite this year?